Sourcing e-procurement services requires much prior forethought and planning and a clearly defined strategy. A basic explanation of e-procurement is that it is the business-to-business purchase and sale of supplies and services over the Internet. External service providers who are experienced in operating an e-procurement business can provide economies of scale resulting in cost savings for the client. However, e-Procurement is more than just a system for making purchases online. A true e-procurement system can connect companies and their business processes directly with suppliers, managing all interactions between them. This traditionally includes the management of bids, supplier correspondence, pricing history and an electronic communication system. Outsource companies provide services covering the design of the strategy through to implementation, hosting and maintenance of the on-going operations. The selection of the right service for a company’s requirements is the key to success. Some e-procurement service providers only provide e-sourcing services, others may only provide the hosting services and some specialize by industry. The whole process from identifying suitable vendors, to obtaining competitive terms and managing the on-going supply relationship constitutes e-sourcing. 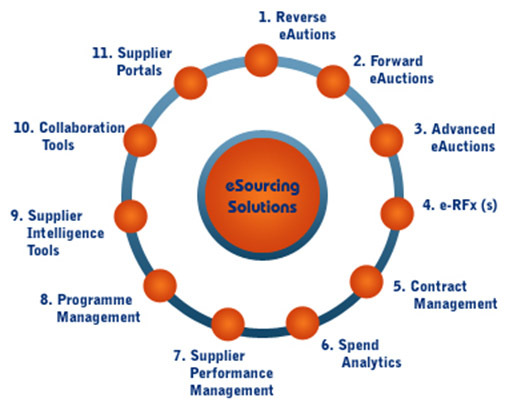 This process, illustrated below, is the central hub of e-procurement. Reverse auctions, where suppliers offer their goods for the best price, is one of the services most offered by e-procurement specialists. The management of the whole sourcing process using a Request for Information or Proposal (e-RFx) through to the finalization of the contract is a popular service that shows the process to be fully transparent as it is managed by a third party. E-procurement services also include doing an analysis of the client’s spend profile, hosting and maintaining a database of suppliers whilst recording their performance history for future negotiations. The more developed and established e-procurement services include supplier and market intelligence, knowledge management and the full range of staff training modules. There is a lot of choice in the level, extent and quality of the services offered in this field. Research is needed and references should be taken from existing clients to ensure that the right supplier is engaged. The selection of suitable e-procurement services depends on the maturity of the client and his intended strategy.